In 2010, the Las Cruces, New Mexico community faced an education crisis which created a serious deficiency in the local workforce and proved a major deterrent for new businesses considering relocation to the area. Las Cruces Public Schools and New Mexico State University proposed building an Early College High School (ECHS) as an innovative way to remove barriers preventing student success. This unique concept focuses on improving academic achievement and providing workforce opportunities for students. While both business leaders and education advocates strongly supported instituting an ECHS in the area, they lacked the up-front financing to make it a reality. In August 2010, NCCD worked with Las Cruces Public Schools to structure and execute a tax-exempt lease purchase for funding the costs associated with design development and construction of the $18.5 million Arrowhead Early College High School. Following the success of Arrowhead Park ECHS, NCCD helped Las Cruces secure $15.5 million in new funding for a second early college high school project in Spring 2013. These funds, along with a $500,000 grant from the Kellogg Foundation, will develop the first dedicated health care core curriculum for an ECHS in New Mexico. In both instances, NCCD relied upon the authority of the school board for the decision to proceed, and by doing so eliminated a twenty-four month waiting period that would have been consumed with the expense of a general obligation bond election. 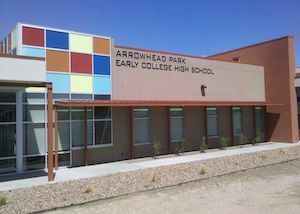 The Arrowhead Park ECHS model is now being applied to other areas of the state and has attracted support from political leaders such as New Mexico Governor Susana Martinez. In addition, its success has also attracted private grant dollars from national organizations to build similar institutions. Arrowhead Park ECHS is a prime example of how NCCD is redefining the traditional public private partnership model. The project was the first of its kind in New Mexico, which meant both lawmakers and other school districts would be closely watching its progress. If successful, many hoped this was a concept that could be expanded into other areas of the state facing similar challenges as Las Cruces. These raised stakes meant it was vital for Las Cruces to form a partnership with a private entity that allowed their uncompromised vision to come to fruition. In traditional public-private partnerships, the public entity often relinquishes control over the final design and operation of a facility in exchange for a capital investment, and this was a sacrifice Las Cruces could not afford to make. As a nonprofit organization, NCCD acts solely as an intermediary to help turn plans into completed projects, and this commitment meant we could provide Las Cruces a solution that would be less expensive and time consuming than a for-profit private company. Read the full letter of support from Stan Rounds, Superintendent of Las Cruces Public Schools, here.